NASR-ED-DIN HODJA yawned. He stretched his arms in their gaily striped sleeves. He stretched his long legs in their yellow pantaloons. "Time for bed!" He rubbed his eyes. "But first a good cold drink of water." Nasr-ed-Din Hodja reached for the earthen water jug. Empty! "Fatima!" he called. "Fatima!" No answer! 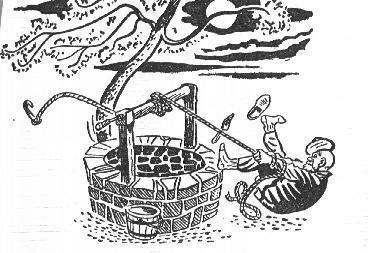 He must go to the well and fill the jug himself. Drowsily he stumbled to his feet. He straightened his turban which had fallen over one ear as he dozed. At the door he shived his bare toes into his scuffly pointed shoes before he stepped out into the moonlit courtyard. "Such an evening!" He breathed deeply of the cool night air. As he ambled across to the well, Nasr-ed-Din Hodja was glad that Fatima had been asleep. It was worth the effort of coming out to the well just to see such a moon. He sniffed the fragrance of the almond blossoms, feathery soft in the silver light. "I wonder if the water looks black or golden on a night like this," thought the Hodja. He leaned over to look down into the well. His drowsy eyes popped wide open. Instantly he gave a low scream. "What has happened?" he cried. He looked wildly about for someone to help him. "Fatima!" he called. "Fatima! The moon has fallen into the well!" No answer! There was no one to help.. Something had happened that would make the whole world a sadder, darker place. He, and only he, must make it right again. He would find a way. He would be a true hero. Nasr-ed-Din Hodja fluttered about. He did not know exactly how to begin being a hero, but he did feel very brave and important. "I have it!" he cried as he noticed the empty hook on the end of the rope he held in his hand. "If this hook can lift water jars in and out of the well, it surely can lift the moon out." His hands trembling with excitement, he let the rope down deep into the well. The hook clattered on the rough stone sides as it went down. There was a muffled splash as it hit the water. "Keep up your courage, good Moon!" The voice of the Hodja sounded hollow in the well. "I am here! All will soon be mended!" He dangled the hook near the surface of the water, swinging it back and forth until he felt it catch on something solid. Giving never a thought to the jutting stones that lined the well, he was sure that it was the moon he had hooked. He jerked and tugged, but the hook held fast. "Jump when I pull, good Moon," he called. "Do not pull against me." He braced his feet and put every bit of strenth into one mighty yank. Up came the hook. Down on the cobblestones of the courtyard went Nasr-ed-Din Hodja. He lay on his back, blinking up at the sky. Suddenly he forgot the pain of his fall. He rubbed his eyes and looked again. Yes, there above him shone the full round moon. That mighty pull of his had carried the moon out of the well and had shot it back to its rightful place as queen of the night sky. "Oh, Moon," said the Hodja in triumph, "it was a hard fight, but I saved you. Now you can shine again for all the world." Rubbing his bruised head, he scuffled back into the house. He was so content with his own heroism that he completely forgot the empty water jug at the edge of the well.